Metro Heavy Duty Dolly Trucks consists of 4 shelves, posts, sleeves, and 5″ resilient rubber plate casters, two with brake. Overall height is 68 7/16″. Weight capacity is 1000 lbs evenly distributed. Dolly bases have a sturdy, riveted channel frame construction and are available in aluminum and stainless steel materials. A variety of plate casters is available to configure a heavy duty cart specific to the application and environment. Additionally, the rigid dolly provides greater stability, control, and impact resistance especially when traveling long distances , over rough or choppy floors , over-the-road, or across thresholds. Furthermore, Metro Heavy Duty dolly trucks have a maximum weight load capacity of 1000lbs. (454kg) evenly distributed. Because bumpers are included: choice of either corner bumpers or full wraparound bumper. So plate casters are available in swivel, swivel/brake, rigid, and brake/lock versions. Futhermore, plate caster models are suitable for dry environments. Stainless Steel cart washable models are available for corrosive applications. 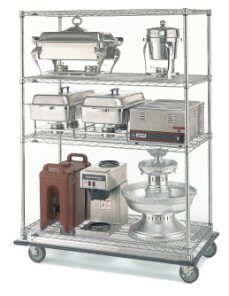 Dolly bases can be installed on each of Metro’s wire and plastic shelving systems. Metro Heavy Duty Dolly Trucks consists of 4 shelves, posts, sleeves, and 5" resilient rubber plate casters, two with brake. Overall height is 68 7/16". Weight capacity is 1000 lbs evenly distributed.